The Love Lives Boulder is positioned at the center of the Ambition Masterpiece. All the rocks in Wolmyeongdong represent people and the Holy Trinity. Pastor Jung Myung Seok set each and every rock with the mindset that he was saving one life. That is why words “Love lives” is engraved on the Love Lives Boulder. We had the Love Lives boulder before building the Ambition Masterpiece on the front mountain. When Pastor Jung prayed about what kind of writing to engrave, the Holy Son told him to use that week’s sermon title, which was “love lives.” He practiced writing it ten times before writing the official one. The engraving took one week to complete. The worker engraved the phrase deeply for greater contrast and looks. Although the draft was rough, he did well. He poured his heart and soul into it as he worked with his utmost power. He was sure when the bigger rocks came he would be able to carve with more confidence. However, after 20 days had passed, they could not find bigger and taller rock. Halfway through completing the Ambition Masterpiece, we had to locate good rocks with writings engraved on them. So Pastor Jung put the Love Lives boulder on its current spot temporarily. Everyone was pleased and said the rock had the right height and looked great. Ultimately they couldn’t find a better rock. 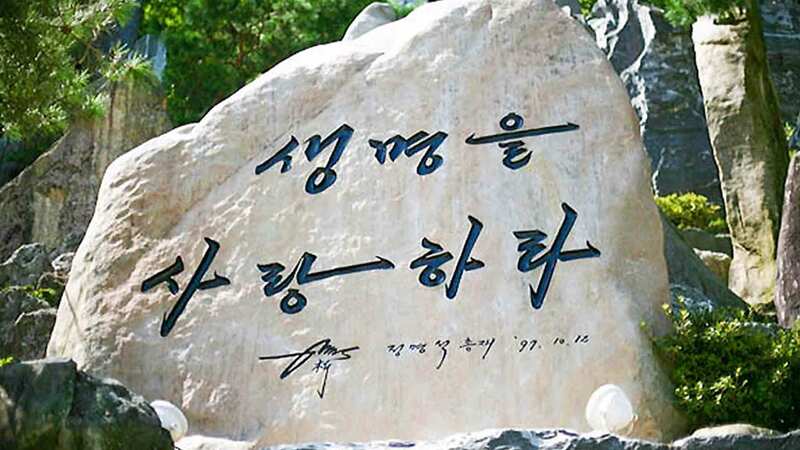 Thinking about it now, the Holy Son chose the Love Lives boulder to be bought, made Pastor Jung write the phrase that would be engraved on it, and used the worker to carve the writing on the boulder. The quality of the rock is great, and it looks great from the bottom of the sports field. It is shiny like other hard rocks. It was Jehovah Jireh.